Find great affordable holiday accommodation & places to eat, or visit with your dog. Let’s face it we are a nation of dog lovers, we love spending time together and having lots of fun. Unfortunately, it is a sad fact of life that it is difficult to find places that we can trust to visit with our dogs. Perhaps you want to enjoy a well-deserved break with your dog? We strongly believe that the whole family including the dog should get to enjoy the wonderful villages, towns and cities in and around the UK. That is the main reason why we have made it our mission to help you and all of our furry friends across the country! We know that it is not always easy to get the information about them or even realise that they exist. Here at The Dog Friendly Scene, we can get rid of this confusion quite easily by giving you the details that you need all in one place. We do not just list details about any old place. We list only those places whose owners have contacted us personally or that have been highly recommended by partners and friends. We make sure that they are fully dog-friendly before listing on our site. Therefore, you can rest assured that if you visit that place, your companion will be given a warm welcome and not the cold shoulder. We know how important it is to enjoy holidays, after all, you been waiting all year for this. We have listed the most suitable accommodation that allows pets, so rest assured all the properties and establishments you find here are fully dog-friendly. They include details on how much, where you can book them and even a bit about the location from a dog owner’s point of view. Talking from experience we have found there to be several top locations that are spread out all over the UK. Surrounded by hills, dales and valleys The Lake District is an absolutely stunning part of England. Here you will find picturesque towns and villages dotted throughout, enjoy forest walks and fresh air. Another good choice is The Peak District furthest north out of the two gorgeous British countryside’s. You will not be short of beautiful landscapes, lakes and mountains, all in which is surrounded by wildlife. Since its home to the Red deer and Red Squirrel, you may even get lucky and come across one. How about the popular location of Devon? Located Southeast of England it boasts beautiful sandy beaches and quaint seaside towns, pretty ports and several harbours along the coastline. If you like to be by the coast, Cornwall would be a great option for you. It has over 300 miles of dunes and cliffs. With its picturesque harbour villages such as Fowey and Falmouth, it’s a must visit. There really are so many wonderful places that you can visit right on your doorstep. Other top locations include Norfolk, Wales, Yorkshire or The Cotswolds, and these are just a few more awesome places to enjoy a dog-friendly UK holiday. Whatever it is your looking for The Dog Friendly Scene can help find the best dog friendly places for you and your dog to visit. 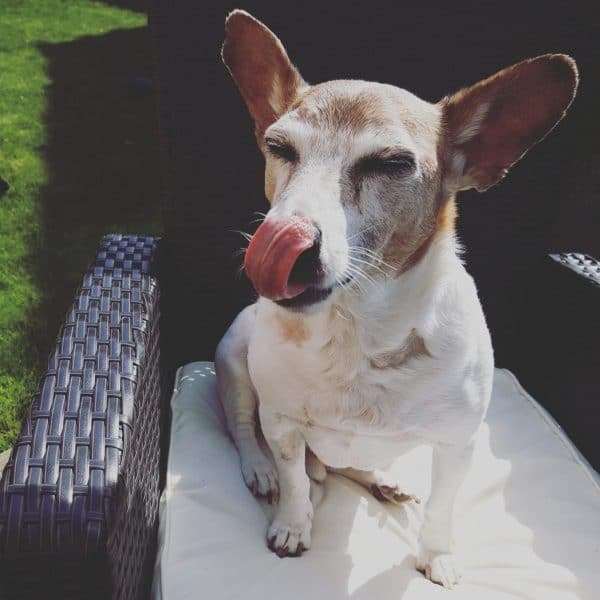 Our very own dog "Pippy" enoying a sit down and a face lick :) read about us and how we got started. From one dog owner to another dog owner, its great to be a part of the UK dog family holiday scene. We dog owners will love reviews from other dog owners. Come back and add your review. You can find some special properties listed with us that have built-in gyms, golf course on site, stables or even a hot tub, great for those wanting the perfect relaxing getaway. Well, we all know that our furry friends love to go walkies you only have to say the word for some to get very excited and run rings around the living room. You will find many walking routes around the UK. The Lake District, The Peak District and The Cotswold have several safe walking routes. They also have beaches which dogs love to just run about and play in the sea. It’s a perfect break for them, especially if you live in the big city. Nothing, it’s completely free to browse our listings and we only ask that you help us and other dog owners by leaving your comments about your stay or about the establishment that you have come across. After you have chosen a property you can book with confidence with our trusted partners. You can find some amazing late deals from award-winning holiday rentals. We get a little bit of commission from each sale which goes to the upkeep of the website and we also donate to several animal charities in and around the UK. All dogs are welcome, we never judge dog breeds. When you travel with your pet be sure to be organized check your terms and conditions, check-in times and route, along with your booking conditions to avoid any problems. CAN I ADD A LISTING? Yes, are you a pet service provider who loves having dogs around and welcomes them to your establishment? Do you provide a service? Dog walking? Or perhaps have a grooming salon? Do you run or own a holiday home? If yes, then don’t delay, contact us for ways of getting listed, you will be able to attract more people to your business once you get listed with us. Do you have any pet travel questions or advice? Please contact us or check out our blog for hints, tips when travelling with your pet. With our help, I am sure you will find what you are looking for. Check out our Pet Blog! Browse the latest posts from our blog.